In a search for a natural and safe way to revitalise and smooth your skin we recommend to apply the bio-engineered Rejuvenation Gel Viscobella®. This highly biocompatible injectable stabilized and highly purified hyalronic acid extracted from a synthetic source, structurally identical to the body’s own hyaluronic acid will support your dermal structure to restore its natural apearance. Viscobella® is a remedy made to even out facial deficiencies and its visual effect following the application may last up to 12 months. Viscobella® was developed on the basis of 30 years of experience in the field of hyaluronic acids. The innovative spherification technology (IST) allows to apply spherical particles instead of traditional structure of irregular rhomboids. As a result the skin shows an even smoother and long lasting effect. 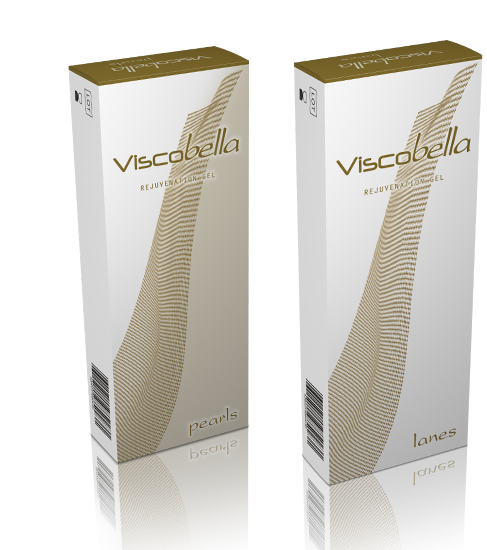 Viscobella® pearls, injectable intra-dermally into the deep layer of the dermis and/or the surface layer of the subcutis, is intended for the correction and shaping of moderately deep to deep wrinkles and folds, and for facial contouring. Viscobella® lanes injectable intra-dermally into the mid dermis, is used to advantage in the correction and shaping of superficial to moderately deep facial wrinkles and folds, as well as for lip enhancement. The product may be used to give increased fullness to the lips, and to mark the edges of the lips, or to create a distinct Cupid’s bow.